Truly, this is Chey’s daughter. For those of you who know Chey, you know she reads a lot. Really. I noticed a book in the shower this morning. Anyway, it seems Eva is picking up Chey’s affinity for books. She can’t read yet (she only 1.5 yrs). 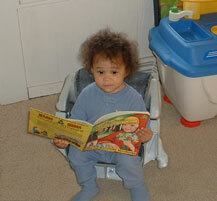 However, she often picks books up and flips through them, mumbling to herself as though she is reading. Case in point, I just took this photo of her about an hour ago. How do you know she can’t read? Maybe she’s just not ready to enunciate. Or maybe she invented a secret Eva language and she is translating all of her books and that’s why you can’t understand her.